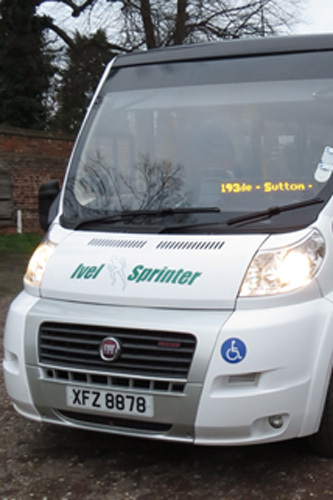 The Ivel Sprinter started operations in 1991, in response to requests made by villagers in East Beds (notably in Tempsford) who had been left without any satisfactory form of local transport. Money was raised from local businesses and organisations to purchase the first bus and services were started to best meet local residents' needs for shopping, attending doctors’ surgeries and other such essentials. The organisation was set up as Limited Company with charitable status, and the entire team of Management Committee and Drivers were, and still are, volunteers. As time has passed, the local services have grown to encompass journeys to Cambridge, St Neots and Bedford on a weekly or monthly basis, whilst still satisfying more local needs. We are now on our third vehicle, and although our operations are self-sustaining, we still require support from others to purchase replacement buses. These have always been minibuses (16-seaters), so that we can operate with non-professional drivers. Our volunteer drivers are mostly retired, and come from many backgrounds - the thing they have in common is that they are all experienced and careful drivers and are committed to helping the community. We are always on the look out for new volunteer drivers, and/or volunteers to assist on our committee. Please call the phone number on the "Contact us" page if you can help us. We have recently received a grant from the Bedfordshire Rural Transport Partnership Delegated Fund towards Minibus Driver Awareness Scheme (MiDAS) training for all our drivers in order to improve driver and passenger safety. We are members of the Beds Transport Brokerage scheme, which provides mutual support between minibus operators and a centralised hiring scheme for potential infrequent users. We are supported by Central Bedfordshire Council and registered with the Traffic Commissioners to operate scheduled services within and outside Bedfordshire. Our scheduled service timetables are shown in the accompanying pages, but we also run other services for local organisations when our scheduled services are completed. © 2019 Ivel Sprinter All rights reserved.